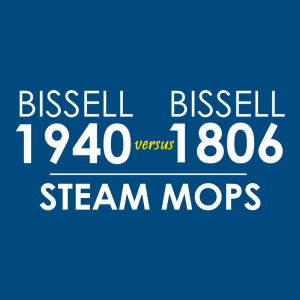 We’ve given our report on both the Bissell Sweep Up and the Saganizer Floor Sweeper, but on this post, we’re giving you a comparison between these two products. They look similar, but which one should you get? Should you stick to the more popular brand, or should you put your money on the other option? This side-by-side comparison should help you make a decision. Final Word: Which One to Get? Why should you even consider buying either one of these brands? Because first of all, if you’re looking for something compact and small, the Bissell Sweep Up and the Saganizer Floor Sweeper has a small footprint. “Small” here is described relative to other models such as the Shark V2950 which has a 13-inch sweep area. 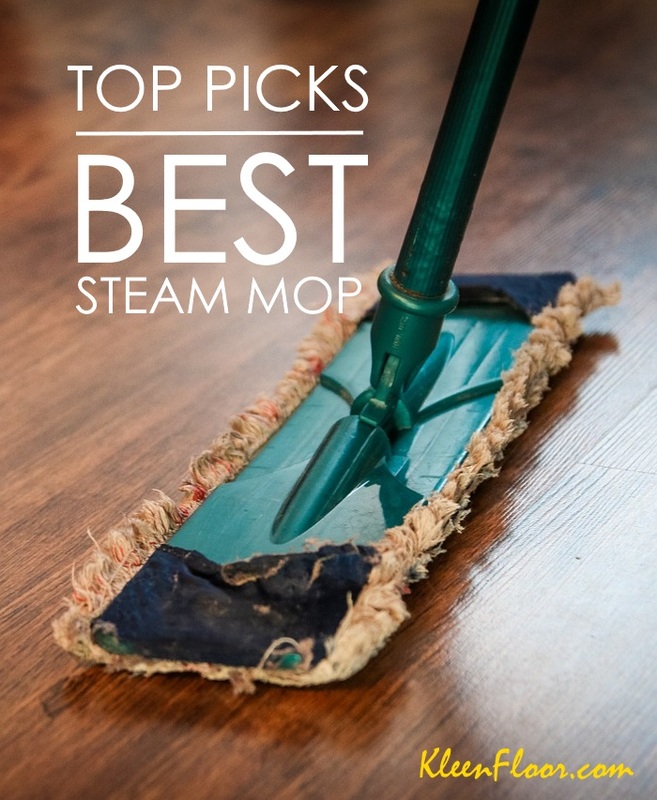 Next, these sweepers have a simple, no-fuss design. The handle is assembled by simply screwing the parts together. There are no buttons, no folding function, and no other sophisticated attachments. The handle and the main unit are joined together by a piece that looks like an ice chest’s carrying case. This part can be pushed down to reach underneath furniture pieces. How do these sweepers pick up dirt particles? Both of them are equipped with brushes that rotate when you push them forward. The bristles collect the particles and then deposit them in the unit’s dirt cup. 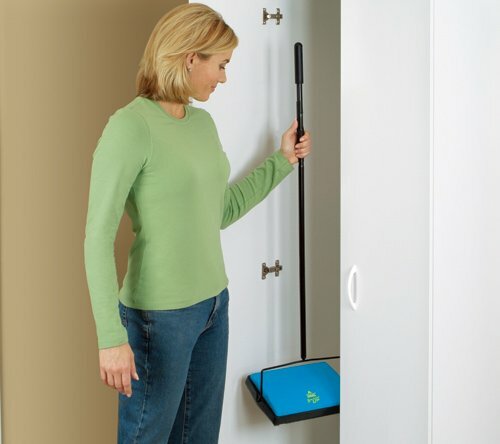 When you’re done cleaning, simply pull or push the compartment’s cover and empty it out. 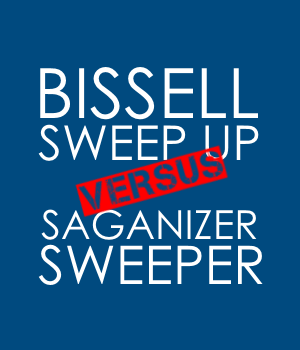 Last, both the Bissell Sweep Up and the Saganizer Floor Sweeper are hand-powered. They don’t have batteries to give the brushes extra power, so they can save you money on electricity. They’re also easy to store. How do the features of the Bissell Sweep Up and the Saganizer Floor Sweeper compare? Here’s a chart showing you the difference or similarities in their features and specs. Here are some quick notes. 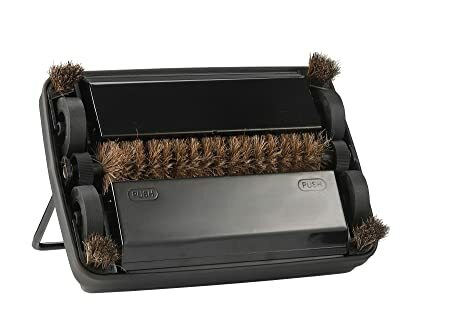 The Bissell Sweep Up has 7 brushes underneath. Three are located along the unit, and the other four are smaller brushes placed in each corner. The Saganizer Sweeper has only 5 – the longest one is located at the center of the unit and the 4 brushes are smaller ones placed in each corner. Bissell Sweep Up comes in a variety of models, which can indicate its color. For instance, 2101-3 is black and 2101-B is blue. Based on our separate reviews of the Bissell Sweep Up and the Saganizer Floor Sweeper, these sweepers have been given comparable feedback as regards their performance and limitations. Both of them can clean up a variety of dirt and other small particles, but you should be careful with too much strands of hair. They can clog the bristles, which requires more effort to clean them up. That said, both of these brands are ideal for people looking for a compact floor sweeper that works well for quick and frequent cleanups. But if brand popularity matters to you, stick to the Bissell. Continue reading our Bissell Sweep Up review and Saganizer Floor Sweeper review.